BARCELONA, Spain, July 24, 2012 (ENS) – Four people have died in two giant wildfires now devastating northeastern Spain’s Catalonia region. Since they blazed up on the weekend, the fires have injured at least 100 people and scorched about 10,000 hectares (38 square miles). Authorities have ordered 150,000 residents to shelter in their homes. One fire has charred the forests of Costa Brava, one of Spain’s most popular beach and resort destinations. Inland, the town of La Junquera, in the border area between France and Spain, is at the center of a second huge fire, that police believe was started by a discarded cigarette. All four of those who died were French. One man died of a heart attack while trying to protect his home in the Catalonian town of Llers, and another died from burns. A father and his 15-year-old daughter lost their lives while trying to escape the flames by jumping down a cliff in the Costa Brava town of Port Bou. Flames forced the father and daughter, as well as three of their family members and some 150 other visitors, out of their cars as they were returning to France from the Spanish coast. As ash from the Costa Brava fire reaches Barcelona this morning, Spanish firefighters say they are starting to gain control because strong winds that initially fanned the flames have now abated. Temperatures have soared to over 32 degrees Celsius (90 degrees F.) in the stricken area, and water levels in reservoirs are low there and across the country, according to the Ministry of Agriculture and Environment. Planes are dropping water in an effort to douse the raging fire in the border area between France and northern Catalonia, but until the fires are under control several cross-border roads connecting Barcelona with France have been closed. 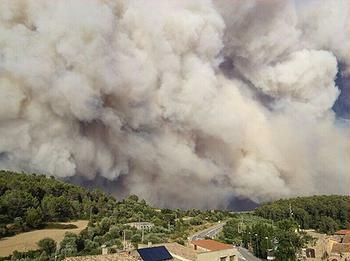 Other fires are taking their toll across southern Europe. In Croatia, hundreds of firefighters have been called up to battle fires all along the Adriatic coast. A firefighter died Monday while putting out a fire near Moscenicka Draga on the Istria peninsula, while other fires blaze near Pula at the southern tip of the peninsula. At least 350 firefighters battled a large fire near the coastal town of Crikvenica, a favorite vacation spot for residents of the nearby Croatian capital of Zagreb. Homes in Crikvenica were in danger Monday but the firefighters defended them. Residents fled and gathered to watch the situation from a safe distance. One of the most serious fires has caused locals and tourists to flee the Croatian coastal towns of Selce and Novi Vinodolski. In the popular resort town of Selce on a long, sandy beach, more than 1,500 visitors were forced to evacuate the Selce autocamp and nearby Club Adriatica. More fires are burning on the islands of Rab and Mljet and near the town of Sibenik, located in central Dalmatia where the river Krka flows into the Adriatic Sea.